Thanks to Interface Builder, we can setup most of our interface with drag and drop, without resorting to too much custom code. Interface Builder will let us setup controllers, views, and establish how data flows among them by following the MVC (Model/View/Controller) model. But now we have some IB-exotic data, like a dual choice orientation between landscape/portrait, and we want a custom NSControl or custom NSView to edit it. (Radio buttons must know their limits) How do we bind our data to our new control ? Interface Builder won't let us do it, it will only let us bind keyPaths it knows. So we have to do it … manually. With code. Argh. bind:toObject:withKeyPath:options: is the binding function. But ... which way do we bind ? Do we bind from controller to view, or view to controller ? And how do we get notifications of change ? Thanks to key value observing (KVO), addObserver:forKeyPath:options:context: will spy on an object for us and notify of a keyPath change. 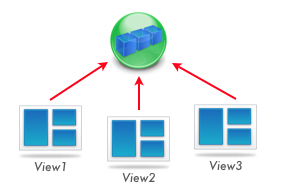 So we call bind, then add an observer … which way do we bind already ? As we're observing, we'll let the views observe the controller. When the controller changes, views will be notified. Then, to bind arrayController.selection.orientation and view.orientation, we call [view bind:viewKeyPath toObject:controller withKeyPath:controllerKeyPath options:…]. 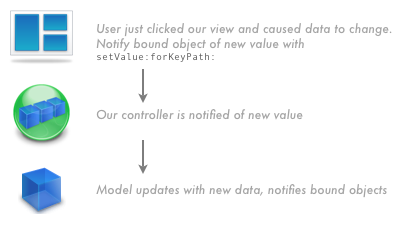 We override view's bind method and in it, start observing the controller for keyPath change with [controller addObserver:view forKeyPath:controllerKeyPath options:… context:…];. 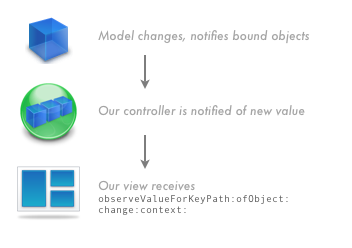 KVO will then notify us of any controller keyPath change by calling our view with observeValueForKeyPath:ofObject:change:context:. Check out WebViewControl for sample code.